Photo: House at 3500 Via de la Reina, ca. 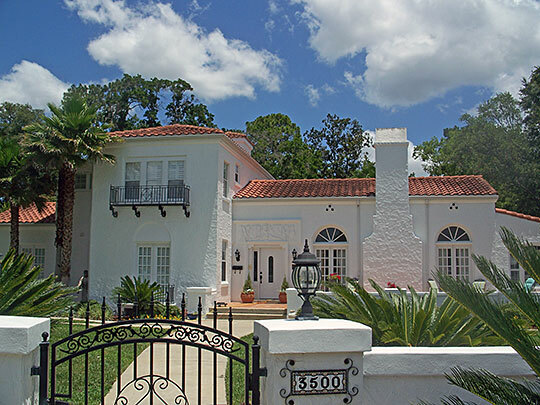 1925, San Jose Estates Multiple Resource Area, Jacksonville, FL. The San Jose Estates Multiple Resource Area was listed on the National Register of Historic Places in 1985. Photographed by User:Ebyabe (own work), 2011, [cc-by-3.0 (creativecommons.org/licenses/by/3.0)], via Wikimedia Commons, accessed June, 2013. The Duval County Courthouse is located at 501 West Adams Street, Jacksonville, FL 32202; phone: 904-255-2000. Established in 1822, Duval County was named for William Pope DuVal who served as governor from 1822-1834. The governments of the county and the City of Jacksonville were consolidated though some cities (Atlantic Beach, Baldwin, Jacksonville Beach and Neptune Beach) maintain separate municipal governments.